Translated – Acire has now got support for multiple languages, but this is very new so it needs your translations! Want to help make Acire rocking in your language? Easy. Go and contribute here! Edit Snippets – Acire now allows you to edit the code inside a snippet and execute it within Acire itself. Save Snippets – You can now save the snippets, even if they have been edited, into a specific file on your system. Look and Feel Polish – a little bit of spit and shine has been applied to respect your chosen monospace font, use a scalable icon for docky and a few other little changes. As I have mentioned before, I the snippets that Acire shows and the Acire itself are in two separate packages (this means that others can write viewers to view the snippets on other environments). Right now packages are available for Ubuntu 10.04 Lucid Lynx and Ubuntu 9.10 Karmic Koala packages should be available soon. The fuel that makes Acire rock is the library of snippets. To really get the most out of Acire and it’s library of snippets, we need you to contribute snippets that demonstrate something in Python. These snippets are really helpful in showing us all how a given Python modules works, and really helpful in lowering the bar to development. Here is how you can contribute a snippet! Jono, when I start Acire, I have only 3 categories in the top drop-down: PyGTKSourceView, PyGTK and Cairo. However, when I download a branch of python-snippets, I have a lot more categories (pythoncore, pythonvte, pattern, notify-osd, etc). Shouldn’t those other categories be available in Acire too? Did you install the daily PPA of Python Snippets? Yes I have python-snippets daily installed but it looks like the karmic version only includes pygtk and pygtksourceview. I removed and re-installed it just to make sure but it doesn’t make any difference. There is a problem with the package it seems, Bruno. Hang tight while I try and figure out what is going on. Sorry about this! Fortunately because you are subscribed to the daily PPA, you should just get a brand new working package automatically soon. Great tool to improve your python knowledge. Just tried to translate it (German), but I think not all strings are translatable yet. Or am I wrong? I didn’t find the strings »Execute« or »Copy« in Launchpad to translate. Ok, thanks for this information. I translated acire while having breakfast, but I hope the translations are ok though. Great tool Jono. when should we expect packages for 9.10? Apologies for not so being patient. I’m also curious as to whether we can hope to see new packages released for 9.10. 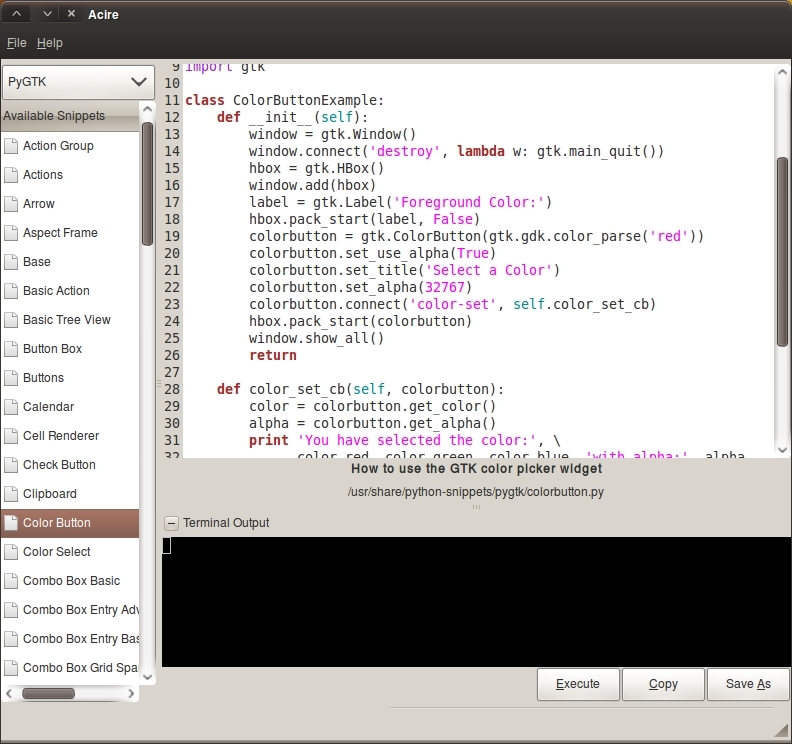 When Lucid is released, will you provide instructions for adding the Python snippets using groundcontrol? This would help out none command line users. As a followup to our sidebar discussion elsewhere. You might want to consider requiring all snippets submitted for inclusion be licensed BSD to lower the complexity of licensing compliance of resulting applications. Sort of how launchpad translations moved to a policy of BSD for all translation submissions. Since the purpose of the snippet collection in Acuire is explicitly about code reuse a policy of BSD only for the snippet library now, may help prevent licensing compliance confusion later as quickly built apps mature and redistribution issues become important to the application authors down the road 6 months to a year from now. The dependencies of the PPA-package are wrong, though. It misses python-gtksourceview and python-gnomeprint. How deep is the snippets archive aiming to be? Should django snippets be added even if they are not able to do anything useful if executed? This could be very interesting if we could plug into Anjuta and use the snippets as templates.